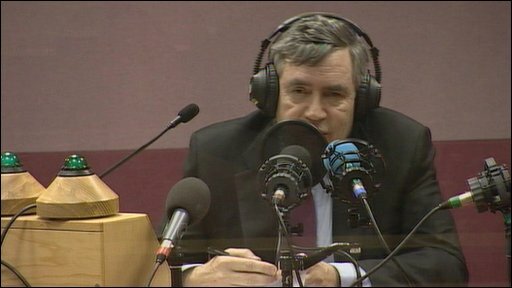 Gordon Brown has apologised after being caught on microphone describing a voter he had just spoken to in Rochdale as a "bigoted woman". 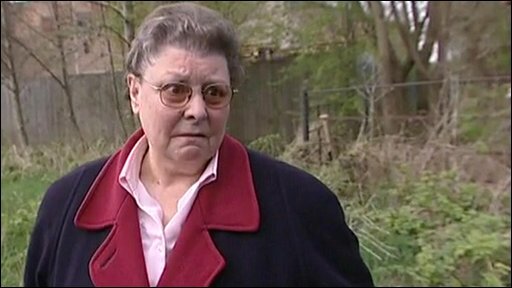 Sixty-five-year-old Gillian Duffy had challenged Mr Brown on a number of issues including immigration and crime. Mr Brown later phoned Mrs Duffy to apologise after the tape was played to him during a BBC Radio 2 interview. After listening to the recording, with his forehead resting on his hand, he said: "I do apologise if I've said anything that has been hurtful." The Prime Minister is now travelling to apologise to Mrs Duffy in person. The comments were made after the conversation with Mrs Duffy which ended with him complimenting her and her family. 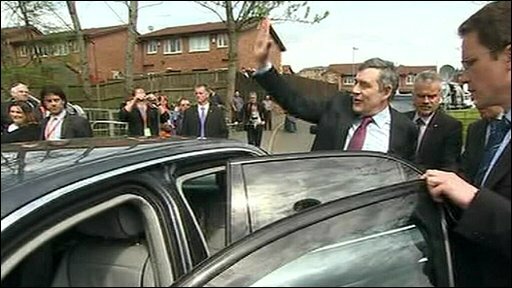 As he went to get into his car, Mr Brown told her: "Very nice to meet you, very nice to meet you." But off camera, and not realising he still had a Sky News microphone pinned to his shirt, he was heard to tell an aide: "That was a disaster - they should never have put me with that woman. Whose idea was that? It's just ridiculous..."
Gillian Duffy: "I want to know why I was called a bigot"
Mrs Duffy said after hearing of Mr Brown's comments: "I'm very upset. He's an educated person. Why has he come out with words like that? "He's supposed to be leading the country and he's calling an ordinary woman who's come up and asked questions that most people would ask him... It's going to be tax, tax, tax for another 20 years to get out of this national debt, and he's calling me a bigot." Mrs Duffy, a widow who has a daughter and two grandchildren, said she used to work with disabled children for Rochdale council before she retired. She had earlier told reporters she was a lifelong Labour voter and described Mr Brown as being "very nice". Nick Robinson added that the irony was that if his comments had not been picked up, it would have been a lively election exchange which would have been seen to do him credit. Speaking on Radio 2's Jeremy Vine show, Mr Brown said: "Of course I apologise if I've said anything that's been offensive and I would never put myself in a position where I would want to say anything like that about a woman I'd met. "I blame myself for what is done, but you've got to remember that this was me being helpful to the broadcasters, with my microphone on, rushing into the car because I had to get to another appointment and they have chosen to play my private conversation. These things can happen, I apologise profusely to the lady concerned." Mr Brown later telephoned Mrs Duffy to personally apologise for the comments, telling her he was very sorry and said she "is a good woman". When asked did this in any way make up for the comments she said "no - absolutely not". A spokesman for the prime minister said: "Mr Brown has apologised to Mrs Duffy personally by phone. He does not think that she is bigoted. He was letting off steam in the car after a difficult conversation. "But this is exactly the sort of conversation that is important in an election campaign and which he will continue to have with voters." The Conservatives said Mr Brown's comments spoke for themselves. Shadow chancellor George Osborne said: "That's the thing about general elections, they do reveal the truth about people." Liberal Democrat leader Nick Clegg said: "You should always try to answer the questions as best you can. He has been recorded saying what he has said and will have to answer for that." Business Secretary Lord Mandelson said Mr Brown was "mortified" over the hurt he had caused Mrs Duffy. He told the BBC: "It is very unfortunate that this remark that he didn't believe got picked up. But he should be judged on how he responded. And that's why he apologised immediately." Chancellor Alistair Darling said Mr Brown's apology was profuse and he was well aware he should not have made the comments. "The election campaign will be decided not just on individuals but what the party stands for. There are big issues at stake. Gordon is a man of considerable strength, considerable resilience and considerable substance," he said. "I hope people will judge him in the round. The fact we are coming out of this recession is down to him in no small part."